« CAPAULIN_Muntingia calabura » BANANA_Musa sp. Other names: Bonkera, kait dewsan, chungbi anguoba, athiya kol. 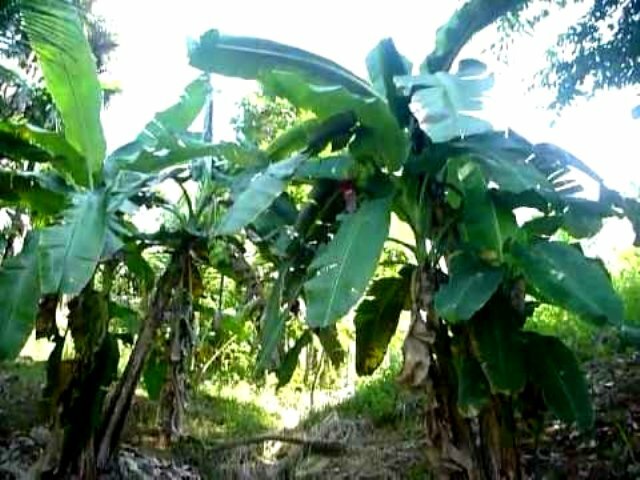 Leaf banana is a widely distributed banana growing wild/semi wild in the East Indian states of Assam, Sikkim and also in some parts of South India. It also grows in many counties of South East Asia. It is a very vigorous plant and is resistant to diseases, drought and other adverse environmental factors. It is easy to grow and does not hybridize with other species. Some of its forms also yield a fibre and therefore sometimes it is confused with Musa textiles. Pseudostems robust, up to more than 6 metres high, commonly at least 30 cm. in diameter at base, predominantly green or yellowish green, the upper parts of the leaf-sheaths often with black markings and the lower parts in age often light reddish brown ; leaf- sheaths and petioles usually more or less glaucous or pruinose, sometimes heavily so. Leaf blades oblong, up to more than 3 m. long, 60 cm. wide, truncate at apex, rounded or slightly cordate at base, green above, paler and more or less glaucous beneath, midribs green or yellowish green ; petioles 60 cm. long or longer, strongly concave above, their edges almost meeting over the adaxial channel, margins inconspicuous above, more developed below, where the petiole passes into the leaf-sheath, here closely appressed to the pseudo stern, not becoming scarious, often bordered by a black line. Inflorescence pendulous, its peduncle and rachis glabrous ; basal flowers female, the number of female hands varying up to about 10 (10 – 15 fide Backer) ; upper hands male. Male bud in advanced blooming broadly ovoid to ellipsoidal, the bracts imbricate at the blunt apex. Bracts various shades of purple, broadly ovate, rounded at apex, often greenish or yellow at extreme tip ; outer surface more or less glaucous, usually longitudinally ribbed, inner surface dark crimson to the base, transversely corrugated between the ribs ; several bracts lifted at the same time, exposing several hands of male flowers simultaneously ; bracts usually soon deciduous after flowering but occasionally persistent in a withered condition, especially in the later stages of blooming. Male flowers about 20 per bract, in two rows ; compound tepal 4 – 5 cm. long, about 1.2 cm. wide, whitish in ground colour but commonly more or less purplish within, the pigmentation varying from a pale blotch at the base of the tepal to bright reddish purple over most of its length, and showing through to the outside as a pink tinge ; upper part of tepal, including the teeth, yellow, varying from pale yellow to rather dark orange, the teeth about 5 mm. long, the 2 outer with a dorsal filiform appendage 1 – 2 mm. long ; free tepal about half as long as the compound tepal, translucent white or pinkish, more or less boat-shaped, obtuse, truncate, or emarginate at apex, with a short mucronate apicula ; stamens at first as long as the perianth, later exserted. Fruit bunch pendent, very compact, the crowded fruits having little room (except in the basal hand) to reflex geotropically, and consequently for the most part standing out from the rachis. Individual fruit about 10 cm. long (7 – 15 cm. Backer), 4 cm. in diameter, distinctly angulate at maturity, rather abruptly narrowed at base into a pedicel of 1 – 2 cm., and more gradually at apex into a short broad acumen ; pericarp about 3 mm. thick, pale yellow at full ripeness, soon blackening ; pulp whitish. Seeds black, irregularly globose, scarcely depressed, minutely warty, 5 – 6 mm. across and 4 – 5 mm. high”. The mature fruits cannot be eaten as these are filled with numerous hard seeds. But when fruits are young and the seeds are not developed, then these are pickled. The pulp is, however, mixed with a little water in Belize and is strained to separate the seeds. A beverage is prepared there from this strained pulp. The male flower buds are eaten as a vegetable. 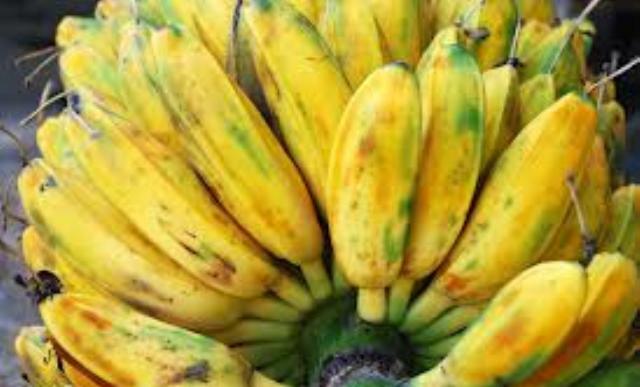 These are preferred to the buds of other bananas for this purpose as these are less astringent. Male flowers and immature fruits are sometimes used in curries in India. Leaves are used for platter and for packing. Besides suckers, this banana can be propagated by seed too. For this the seeds are planted at a depth of 2 cm using a well draining soil mixture. The seeds germinate in 2-3 weeks. Keep the young plants warm, damp and in bright light with high humidity. These should be fertilized lightly every two weeks for the first few months.